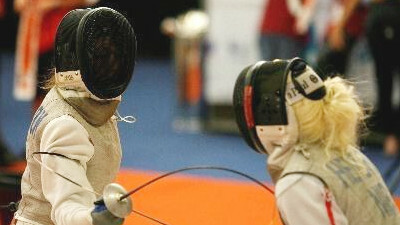 Badges are a good way to structure your learning and set targets for achievement, particularly for younger fencers. As a modern sport, fencing has its own achievement awards scheme for those who like to collect badges. The MiniSWORD Awards for 5-7 year olds are focused on the FUNdamentals of Movement – Agility, Balance and Coordination (ABCs) – as well as the importance of fun in sport and the enjoyment of exercise. Badges and certificates featuring the cheerful, friendly, fencing fox can be awarded at the three stages of the award scheme. GO/FENCE Achievement Awards for children 8+ using plastic fencing equipment; this scheme is undergoing a refresh as of the end of 2017. The weapon specific awards are for ages 8+ using one of the three Olympic metal weapons. 2. Maintain step-lunge distance and as your partner begins a step forward, beat attack direct, with a fleche. 3. Maintain step-lunge distance and disengage attack with an explosive lunge as your partner steps forward to engage your blade in sixte or in quarte. 4. When your partner attacks into the low line, parry octave and riposte into the high line – if your riposte is parried, then parry the counter-riposte into quarte and hit with a direct second counter-riposte.